Halibut are large and flat, and put up a fight. They yield four fillets instead of just two, and their meat is soft and flaky. It lends itself very well to being beer batter deep-fried with a pat of butter on top, or baked in a pan with onions and crème- a regional recipe called Halibut Caddy Ganty, first invented by the Southeast Alaska pioneer of the same name, who lived near the Sea Ranger’s winter homeport. People have fished for halibut for centuries. The first Alaskans developed ingenious technologies to target fish in the 40 to 60-pound range. These are the fish that taste the best, and are least likely to hurt the fisherman in a struggle. This is our target range as well, but from time to time, we end the day with a hundred pound monster on the back deck. Halibut over 200 pounds can be caught as well, but are older, breeding females. We are big supporters of catch-and-release of these productive giants, but now and then we do bring one home, and it’s quite a story to tell. Today, halibut are caught on our large poles, Lamiglas with Shimano reels and high-test lines, or simply by jigging in shallow waters. Halibut like very specific depths and topography, and your Alaskan Experiences guides know where to find them. Company owner Neil is famous for saying that he’d put his halibut fishing up against any in the world. 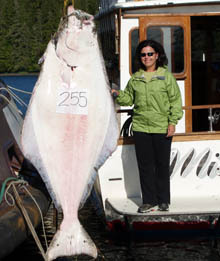 For more information on Alaskan halibut fishing, contact Alaskan Experiences today.